No apologies received for this meeting. Candidates Megan, Hamra, Katie and Richard each gave a two minute speech on why they would be the best person for the role. After giving their speeches, candidates were given a chance to listen and answer questions that were given by their peers. Allowing Youth Councillors to know their candidates more and what they can bring to the role. After questions were asked, Youth Councillors were asked to vote on who they would want to fulfill the role, with the majority going to Megan Birchall. Chris needed to ask each Youth Councillor which area of Oldham they lived and where their school area was. 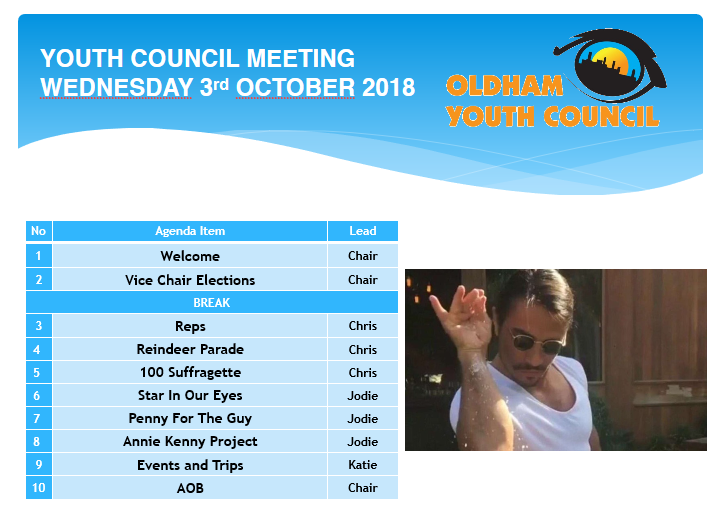 This year, OYC Oldham Youth Council is again taking part in the Oldham Reindeer Parade and Chris asked if anyone wanted to take part, the event is near the end of November. OYC Oldham Youth Council has been given the privilege to take a representative to an event about 100 years of women’s suffrage. Due to the event being about empowering women, it was decided for Samah to be the OYC Oldham Youth Council representative for this event. 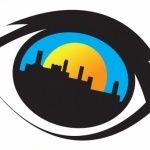 Star In Our Eyes is an awards evening to celebrate Oldham’s looked after children. OYC Oldham Youth Council have a table at the event and names were taken for those who wanted to attend this Friday. The event is being hosted by youth worker Sam and CICCer Paige T.
Penny for the Guy is an event on Bonfire Night. OYC Oldham Youth Council are taking part and have been tasked with making a straw version of Guy Fawkes, who is infamous for plotting to blow up Parliament. This fake Fawkes will be used as promotional material for the event and for the fire at the event. Annie Kenny project is about OYC Oldham Youth Council designing the look of a box that is on the Annie Kenny statue that is currently being made. A few members have liaised with Jim McMahon about the statue and what should go at the bottom, on the box, something that can represent OYC Oldham Youth Council and women’s suffrage. These were given out to Youth Councillors in the meeting.